A soft rain fell late in the Varsity soccer match Wednesday night between the Monroe Bearcats and the Arlington Eagles washing away all hope Arlington had of not being shut out 4-0 by Monroe. The match began in fading evening light with Senior Midfielder Justin Milne #11 scoring with 35 minutes still to play in the half. 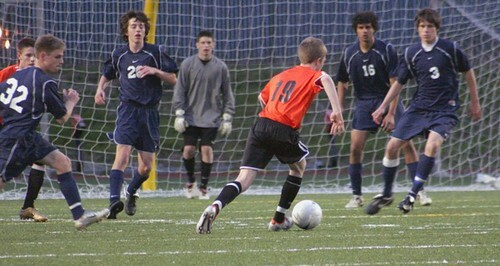 Just 14 minutes and change later he slammed his second point past the Arlington “Keeper”, Goalie Junior Andy Kyle #1. “My head hurts”,Kylesaid after allowing two shots into his net.